One of those things that wouldn't hurt to have in the studio. 8pre, FireWire audio interface from MOTU. It's not at the top of my list, but it's no where near the bottom. It was obtained in a bundle deal and it pays for itself every time I use it. I probably wouldn't have bought one, and it would have been a shame. This thing is reliable and sounds great. USB is great but I always feel more confident with Firewire (not to mention you then have the ability to daisy chain). This audio interface would be a great addition to any studio, professional to bedroom. Great for tracking up to 8 channels at once! But don't worry, it's just as good when you are only tracking 1 channel too. And being a firewire device, you will have one less USB slot filled. I mainly use this with Pro Tools 10, but it works great with almost any other DAW. Some units don't have input meters on the front, and you don't have to use those units! The Motu 8 Pre has brilliant LED input meters (complete with green, yellow and red). With a quick response, the 8 Pre is a serious workhorse. Don't be afraid to run it hard, unlike cheap USB audio interfaces, this one won't crumble under the pressure. The Motu 8 Pre features onboard SMPTE time code synchronization. Time code is generated by the 8 Pre and can be sent to analogue devices. Included is the MOTU SMPTE Console software. This allows the user to strip, regenerate or slave other devices to your computer. Latency seems to be no issue for the Motu 8 Pre. CueMix DSP helps create different output and headphone mixes. You can also add send/return loops for your outboard gear with no noticeable latency. This thing is NOT a burden in any way. It will only take up a single spot on your rack where comparable others can take up many. It's solid design not only feels great to the touch, but it makes me feel a lot more confident when moving it around. If you aren't seriously considering the 8 Pre yet, lets look at a much under appreciated feature: dual XLR/TRS inputs. Cabling and be pricey, and there is nothing worse than buying a new piece of gear and realizing you don't have the right cabling for it. Similar units only have XLR inputs, this is not a bad thing but what if you are going straight into a TRS patch bay. Now you are going to have to order some TRS to XLR cables for the short trip to the patch bay, but not with the Motu 8 Pre. I bought the unit second hand so I'm not sure what it comes with (they didn't even provide the power cable!! Savages). However Motu's website has all the documentation that came with the unit. Motu.com also has all necessary drivers and software that you will need to run the 8 Pre. The 1 button output/headphone control can be a bit confusing at first (especially if you didn't get a manual). But all things considered, this unit is very easy to jump right into. You shouldn't have any compatibility issues with this unit. I liked the sound of the pre amps the best. The gain stage is gentle but can provide a serious boost towards the end. This is one of those analogue to digital converters that sounds more like an all analogue piece. 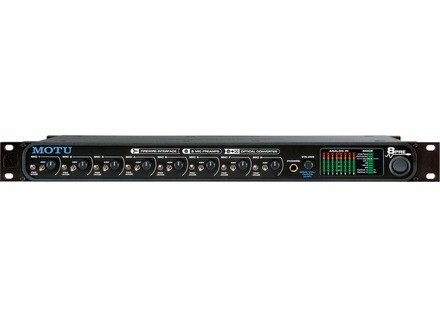 Motu really did a great job with this unit, it in no way sounds like a cheap piece of gear. This was bought in a package with a bunch of other gear so I can't comment on the value for price. The average new price seems to be floating around $500-600ish (depending on generation). Knowing what I know now I would have bought the unit. I'll admit that I wouldn't have bought the unit in the first place if it didn't come in a package deal, but I'm sure glad I've got it.